Monday April 26th 1926 Mattie helped me bring my things down to The Roslyn. I put them in my room and went to see Warner awhile. At two oclock Seth Hart and wife came and we rode all afternoon. Had dinner out in Hollywood and rode up on the mountains later. It was eight oclock when I got back. The Seiberts had left my trunk. Wrote to Hattie. Tuesday April 27th 1926 I went to the bank and to see Warner. Wrote Cousin Jen. Had lunch out of the hotel. Had a sleep later. Mabel came. She went with me to see Dr Emery to say good-by. We had dinner together. Evening at hotel. 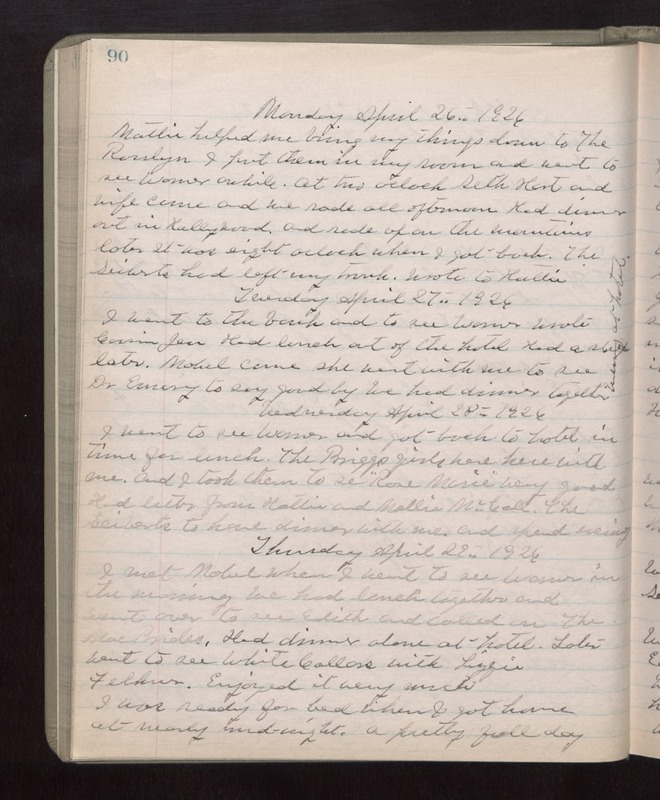 Wednesday April 28th 1926 I went to see Warner and got back to hotel in time for lunch. The Briggs girls here with me and I took them to see "Rose Marie" very good. Had letter from Hattie and Mollie McCall. The Seiberts to have dinner with me and spend evening. Thursday April 29th 1926 I met Mabel when I went to see Warner in the morning. We had lunch together and went over to see Edith and called on The MacBrides. had dinner alone at hotel. Later went to see "White Collars" with Lizzie Felkner. Enjoyed it very much. I was ready for bed-time when I got home at nearly midnight. a pretty full day.